Mysuru: After getting its name etched in the Guinness World Records for the Largest Gathering at a Single Venue and for the Largest Yoga Lesson with 55,506 yoga enthusiasts taking part in the International Day of Yoga last year, Mysuru is once again gearing up to observe the International Day of Yoga (June 21) tomorrow. 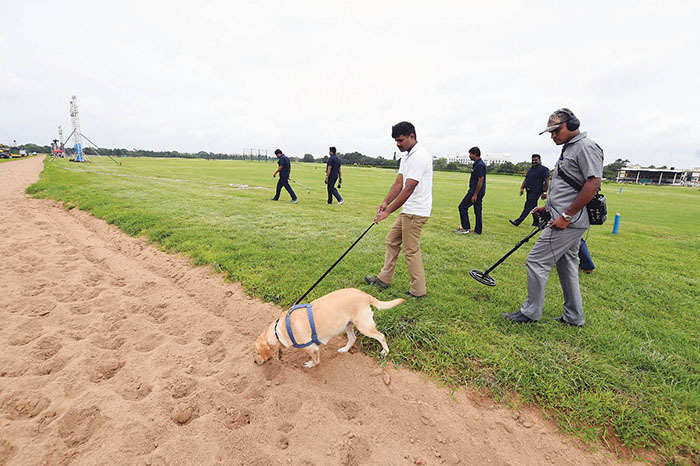 This time, the District Administration is expecting over one lakh participants at the sprawling Mysore Race Course. The event will be held in association with the Department of AYUSH, Sri Pathanjali Yoga Shikshana Samithi, Pathanjali Yoga Samithi and Bharat Swabhiman Trust, Mysuru Yoga Okkoota, Mysuru District Yoga Sports Foundation, GSS Yogic Research Foundation, Mysore Travels Association, Mysuru Hotel Owners’ Association, Let’s Do It! Mysore and others. This morning, AYUSH Deputy Director Dr. Seethalakshmi, Tourism Department Deputy Director H.P. Janardhan, Mysore Travels Association President B.S. 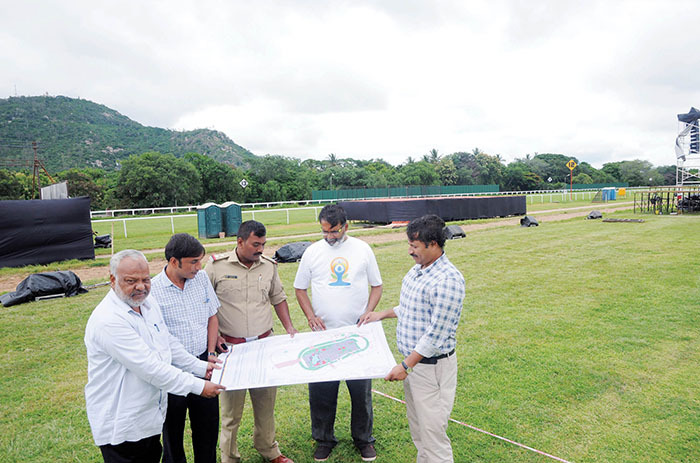 Prashanth, D. Srihari of GSS Foundation and members of Yoga Samithi inspected the Race Course premises where a stage is being erected for tomorrow’s main event. Dog squad and Bomb Disposal Unit visited the venue this morning and scanned the entire area for suspicious objects. 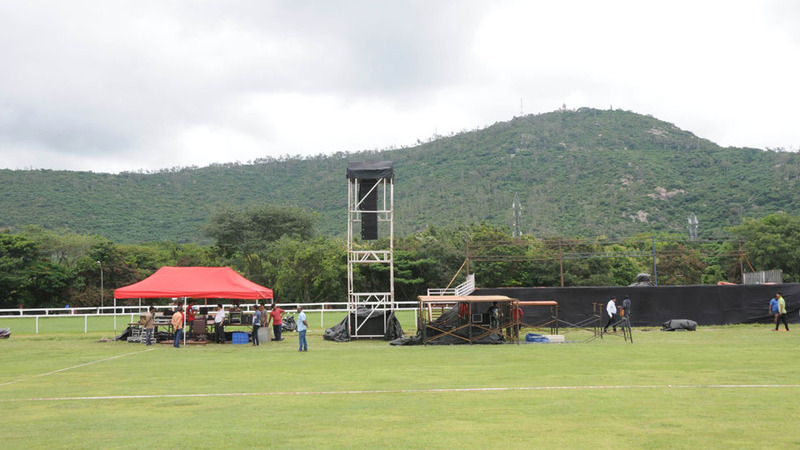 The District Administration has made all necessary arrangements at the venue. The Mysore Race Course authorities will open all seven entry gates at 5 am to facilitate the participants to prepare for yogasanas. All participants have been instructed to bring yoga mats, drinking water and a small handbag. More than 300 schools are participating in the event and they will perform all the 16 yogasanas as per the protocol issued by the Centre. Transportation: KSRTC buses will ferry participants from Kuvempunagar, Ramakrishnanagar, Vivekanandanagar, Srirampura, Vijayanagar, Bogadi, Teresian College, Bannimantap, Raghavendranagar, Hebbal Industrial Area and other places from 5 am to the Race Course. Time: Participants are requested to be inside the venue before 6 am. As it would be a rush, which may result in traffic jams, those coming to the venue in their vehicles are requested to leave their places early. Yoga Blocks: 70 Yoga Blocks have been made and one block can accommodate 300 people. There will be volunteers at every block who will guide the people. Basic facilities: For the benefit of yoga enthusiasts, toilet facility has been made and breakfast will be served to all participants after the event. Medical assistance centre and Police security has also been provided. The programme to be held from 6 am to 8 am will be inaugurated by Tourism Minister S.R. Mahesh. Higher Education Minister G.T. Devegowda will light the ‘Yoga Jyothi.’ Minor Irrigation Minister C.S. Puttaraju and Health and Family Welfare Minister Shivananda S. Patil will be present as chief guests. MLA S.A. Ramdas will preside. Mayor B. Bhagyavathi, ZP President Nayeema Sulthana, MPs Prathap Simha and R. Dhruvanarayan, MLAs A.H. Vishwanath, Tanveer Sait, K. Mahadev, L. Nagendra, Dr. Yathindra Siddharamaiah, Anil Chikkamadu, Harshavardhan and Ashwin Kumar, MLCs Sandesh Nagaraj, Marithibbegowda, R. Dharmasena, K.T. Srikantegowda and K.V. Narayana Swamy, Deputy Mayor Rathna Lakshman, ZP Vice-President G. Nataraj, Taluk Panchayat President Kalamma Kemparamaiah and Vice-President N.B. Manju will be present as guests. Suttur Seer Sri Shivarathri Deshikendra Swamiji, Bishop of Mysuru Most Rev. Dr.K.A. William, Sri Bhuvanakeerthi Bhattaraka Swamiji of Kanakagiri Mutt, Sir Khazi of Mysuru Moulana Mohammed Usman Shariff and Buddhist Monk Bantheji will grace the occasion. Tourism Department Deputy Director H.P. Janardhan, D. Srihari of GSS Yogic Foundation, Dinesh of Karnataka Police Academy and others taking a look at the blueprint prepared for the Yoga Day. Entry gates and parking facilities: Gate 1 – Karanji Lake side, Gate 2- Race Course Main Gate, Gate 3 and 4- Mall of Mysore side, Gate 5- Lorry Stand side, Gate 6- Behind Golf Course and Gate 7- Opposite CAR Grounds. The public can enter from Gate 1 to 6, while entry from Gate 7 is for VIPs and media. Gate numbers, parking facilities and routes to be taken: The following are the Gate Numbers for the participants to enter, parking facilities for each gate and the routes to be taken to reach the gates. Gate 1: Participants entering through Gate 1 should reach Hardinge Circle, proceed via Mirza Road, Vasanth Mahal Road, Lokaranjan Road, Karanji Lake road and Boulevard road. Parking is provided at Karanji Lake premises, ATI premises and the Circus ground. Gate 2: Participants entering through Gate 2 should reach Kurubarahalli Circle and park their vehicles at Karanji Lake and ATI premises and reach Gate 2. Gate 3 and 4: Participants entering through Gate 3 should reach Hardinge Circle, proceed via Mirza Road, Zoo Road and Race Course Circle. Parking is provided at Dasara Exhibition grounds, Mall of Mysore parking lot and Doddakere Maidan. Gate 5 and 6: Participants entering through Gate 5 should proceed via JLB Road, JSS College junction and Truck Terminal road. Parking is provided from Rajahamsa junction to the Mantap on Nanjangud Road, JSS College premises and at the foot of Chamundi Hill. Gate 7: Those entering through Gate 7 should proceed via the Government Guest House’s East Gate, Chamundi Vihar Road, Male Mahadeshwara Road, Vayu Vihar Road, Kurubarahalli Circle, Tavarekatte, take a right turn and proceed through Chamappaaji Road. Parking is provided at the empty space at Gate 7 and at City Armed Reserve (CAR) Grounds. Traffic diversion: Following the event to be held from 6 am to 8 am, the City Police have restricted the movement of all types of vehicles on various routes leading to the Race Course from 5 am to 10 am. The routes where movement of vehicles (except vehicles of participants) are restricted are from JSS College junction on Nanjangud Road via truck terminal road till Race Course Circle, from Kurubarahalli Circle via Lalitha Mahal Road up to Race Course Circle and from Nanjangud Road under bridge on MG Road up to Race Course Circle. Alternative routes: Vehicles coming from Nanjangud Road towards city should take a compulsory left turn at JSS College junction and proceed on JLB Road. Vehicles plying on Lalitha Mahal Road towards Race Course Circle should take a right turn at Kurubarahalli Circle and proceed on Vayu Vihar Road and join Male Mahadeshwara Road to proceed further. Vehicles plying from Mirza Road towards Mysuru Zoo should proceed straight on the Mirza Road to join Nazarbad Circle and proceed further. KSRTC buses plying to Nanjangud side, should reach Hardinge Circle, proceed via B.N. Road, Patashala Circle, Ramaswamy Circle, JLB Road junction and reach Nanjangud Road. KSRTC buses plying towards T. Narsipur and Kollegal should reach Hardinge Circle, proceed via Mirza Road, Vasanth Mahal Road, Nazarbad Circle, Male Mahadeshwara Road, Vinaya Marga, take a left at Kurubarahalli Circle and proceed on Lalitha Mahal Road.